Just please tell me, original or fougere? Is the fougere anything like Le Pere Lucien? Can you describe each scent for those who've tried both? I read the fougere is a bit like LPL or Myrsol Agua Balsamica, does that hold in any way? What about the original? I don't think that either fougere or regular smell like LPL, however the fougere is a much lighter scent than the original so as far as intensity goes I would say that the original is closer to LPL. All three scents are very complex and nice but Original MDC and LPL will jump out at cha. I found the regular way too strong so I would suggest the Fougere. If I were to buy it again i'd pick that one. Neither of them are as strongly scented as LPL. I prefer the scent of the original. I actually find the original and the Fougere quite similar. Why don't you wait to purchase. They seem to pop up on the BST pretty frequently at a better price. (04-07-2014, 09:39 AM)fbones24 Wrote: Why don't you wait to purchase. They seem to pop up on the BST pretty frequently at a better price. I second this, or put out a WTB, you should be able to find some. My thoughts exactly about thinking MdC but I wish.. Travel a lot think the bowl will be a hassle. (04-07-2014, 09:08 AM)daccpa Wrote: I don't think that either fougere or regular smell like LPL, however the fougere is a much lighter scent than the original so as far as intensity goes I would say that the original is closer to LPL. All three scents are very complex and nice but Original MDC and LPL will jump out at cha. (04-07-2014, 09:39 AM)fbones24 Wrote: Neither of them are as strongly scented as LPL. I prefer the scent of the original. I actually find the original and the Fougere quite similar. I wasn't overtly fond of LPL to be honest. If you remember in my review, most of what I could pick up was Vicks VapoRub. I prefer to steer away from too much citrus smelling, I like clean smells more like MWF / Proraso white etc. lavender is nice, so maybe the original? MDC Fougere all the way!!! MDC regular scent is Lavender if that helps. (04-07-2014, 01:40 PM)PR82 Wrote: MDC Fougere all the way!!! In my opinion, describing mdc as lavender is deceiving. Maybe there is lavender in there but I don't get it and I love lavender. Postponing my purchase for another 24 hrs I guess.. So strange how sometimes it's difficult to relay a smell isn't it? Get the large brain bowl (it only comes in original scent). You can see how it's packaged by looking at mine. You can scrap small pieces off the top to pack as a travel soap. I love this stuff and the scent is not as strong as the sealed jar. (04-07-2014, 04:48 PM)Johnny Wrote: Get the large brain bowl (it only comes in original scent). You can see how it's packaged by looking at mine. You can scrap small pieces off the top to pack as a travel soap. I love this stuff and the scent is not as strong as the sealed jar. 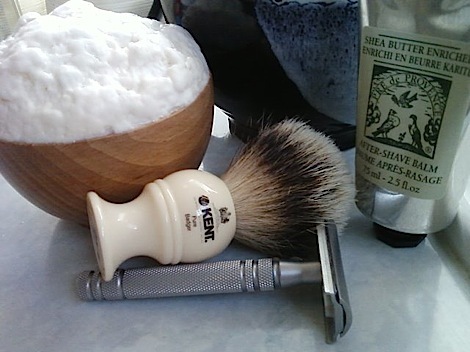 The scent of MDC Fougere is not even close to LPL in my opinion. I think you have the Original and Fougere confused. (04-07-2014, 05:27 PM)jpipes3 Wrote: The scent of MDC Fougere is not even close to LPL in my opinion. I think you have the Original and Fougere confused. Well to me the regular scent does not smell citrus or herbal to me. I share the counter space with my wife and have absolutely no problem with floating hair or makeup. In the tub of MdC "Original" I have, it is definitely a lavender-forward scent. Other aromas are probably there too, but they would be pretty far in the back seat. I'm not sure that MDC is the soap for you then. The Fougere has citrus and the Original is herbal. I own and enjoy all 3 MDC's. So far my favprite soaps, still having C&S 88 and OC on its way to me though.